Autronica Fire & Security, which builds advanced fire detection systems, chose XJTAG for its high price to performance ratio. The company’s engineers are now using XJTAG’s helpful features to design boards with inherently high test coverage and also to interact more efficiently with their chosen manufacturing partner. The company develops the electronic circuit boards for its fire detection systems in house. These contain components such as microprocessors, SDRAM and Flash memories, SD Card interface ICs, USB drivers, RS-232 transceivers, voltage regulators, Ethernet PHYs, A/D converters, real-time clocks, oscillators and serial ports. Today’s boundary scan systems are able to test many of these types of components, including those without their own JTAG circuitry if a connection to a JTAG-compatible device is available. Development engineers at AFS have chosen the XJTAG boundary scan system to test a high proportion of the devices on board and to program Flash memories. “XJTAG provides many advanced capabilities, such as emulating bus signals, as well as reading and checking many analogue signals on the board”, says Arvid Grytdal, Production Technology Engineer. Testing can begin as soon as the initial circuit design is ready, as XJTAG helps to verify scan chain routing and access to non-JTAG devices. As the project progresses, circuit analysis utilities help to maximise test coverage. “By using good design techniques, focused on testability, we can check most of the parts of our circuits”, comments Arvid Grytdal. “When we compared XJTAG with bigger and more expensive systems, we saw that it provided all of the important capabilities and offered significantly better value. Moreover, when the boards enter production, our contract manufacturer, NOCA, is able to test the units using the XJRunner system at no extra cost”, he explains. XJRunner is run-time version of XJTAG, which is optimised for the production line and allows multiple licenses per customer. AFS and NOCA can share test programs and information with no reworking or modifications, and NOCA can pinpoint defects that sometimes cannot be detected by other checks such as optical inspection. XJRunner has the last word on each board before it leaves the factory. Using XJRunner, NOCA can test each board before its firmware is loaded, and is able to identify and repair any failed boards quickly and easily. “This gives us a high level of confidence that the delivered boards are basically sound. We then program any components and configure parameters as needed, before performing functional tests and installing the boards in the systems we deliver to our customers”, continues Arvid Grytdal. “Overall, XJTAG has helped to increase the testability of our products and to drive up productivity”, he concludes. When we compared XJTAG with more expensive systems we saw that it offered significantly better value. It provides many advanced capabilities, such as emulating bus signals, as well as reading and checking analogue signals. Using XJRunner, our manufacturing partner can test a high percentage of each board before its firmware is loaded, and is able to identify and repair any failed boards quickly and easily. This gives us a high level of confidence in each board we receive. Overall, XJTAG has helped us increase both test coverage and productivity. Autronica Fire & Security (AFS) is a United Technologies company headquartered in Trondheim, Norway. 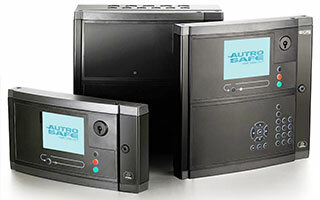 As a developer of advanced safety and emergency systems for commercial buildings, ships, offshore installations and domestic applications, the company produces interactive fire detection systems such as Autroprime for small to medium sized applications and Autrosafe comprising networked panels, detectors and interfaces for use in larger installations.